Recently, we had a really big ice storm. Like really big. Some people were without power for over 90 hours. Everyone was trying to keep warm and the roads were awful. The way the sun shone through the ice on the trees. Everything was like one big skating rink. I felt like I was in Narnia. The trees in our backyard were completely incased in ice. Look how thick the ice is on the branches on the right! Last picture of icicles I swear. 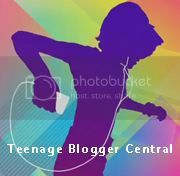 Just dropping by to say thanks very much for registering at Teenage-Blogger-Central! Awesome photography, btw, it reminds me of Birches by Robert Frost..
And no, I absolutely don't mind the amount of icicle photos. Hahaha. Gorgeous photos! I wish that I had the eye of a photographer but I'm glad that I at least have the ability to admire pictures like these! ^_^ Have a lovely day! Those are BEAUTIFUL pictures. Did you take them yourself?